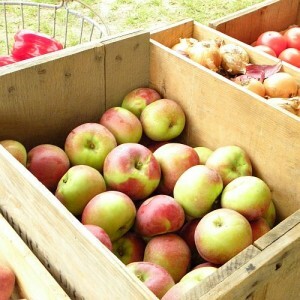 Natural pectin comes from the skin of apples. Crap apples contain a higher amount than store bought apples. Other fruits such as quince, citrus fruits and blackberries, also contain a natural pectin. When cooked out, you can freeze it for later use in pies, puddings and even canning. 2 pounds of sliced apples (one pound if using crab apples. Crab apples are slightly higher in natural pectin). Wash well, but don’t peel them. Discard any with rot or moldy spots on them. 2-3 cups water. Start with 2, and add more if needed when cooking. 3 Tbsp lemon juice in 5 quarts of water in a large bowl. This will help the apples not to turn brown. Slice the apples and place them into the bowl of lemon water. Once you are done cutting strain most of the lemon water. Keep enough to cover the bottom of the pan you will be cooking the apples in. This will help prevent the apples from burning. Put the cut apples in a large stock pot. Cook on high for 5 minutes. Turn heat down to low. Simmer slowly for one hour or until apples are soft and mushy. Strain through fine strainer lined with a wet, clean cloth napkin. You can also use several layers of cheesecloth. You must take care to only get the liquid, and no apple bits. Discard the spent apples into the compost pile. Allow to drain. Hanging it from a knob or shelf will help give it “weight”, and will drain faster. Draining can take a few hours. The liquid that you are left with is your natural fruit pectin. You can freeze, or use right away. To freeze, place one tablespoon into each hole. Once frozen, you can then transfer to a plastic bag to save space. Thaw before use. You will use about 6 tablespoons per cup for your recipes of low pectin fruits for jams, jellies and syrups. Natural pectin is also a great thickener for puddings soups and other recipes.